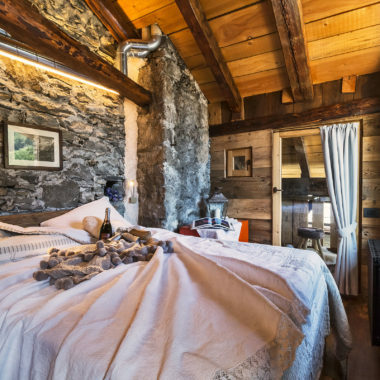 Located in Courmayeur Mont Blanc, Maison La Saxe is a boutique Hotel born from the renovation of a house from the end of the ‘700, with a painstaking preservation and restoration, recovering all existing materials, such as wood and stone. Every detail is designed to make the atmosphere as rustic and cozy as possible, with the surrounding environment and recalling the style of the past. 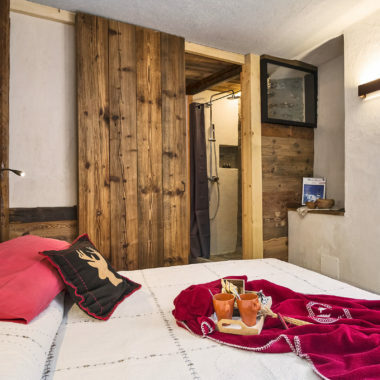 A small hotel run by a local family, in which tradition and charm blend to create a unique and warm atmosphere, typical of the mountain. With six bedrooms, where the intention is to introduce guests to relive the atmosphere of the past, through the experience of living in a high mountain village, rediscovering the rhythms and values, accompanying the discover places, tastes, smells and sensations, through objects, images, stories and typical dishes, all in a family atmosphere, the house has been rebuild in the past three years of works thanks to the hand of the Architect Gaetano Castelnuovo. Developed in 3 levels, the house has at the ground floor the living room were the morning the breakfast is served with typical products such as yogurts, cheese, ham and fresh fruit. 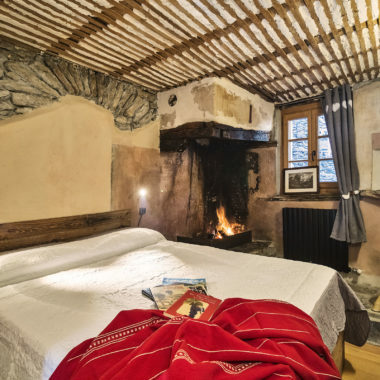 On the first floor there are two double: one with an old fireplace dating back to 1814 and the other one with a nice view of the surrounding mountains. On the same floor there is also one single room with king bed. 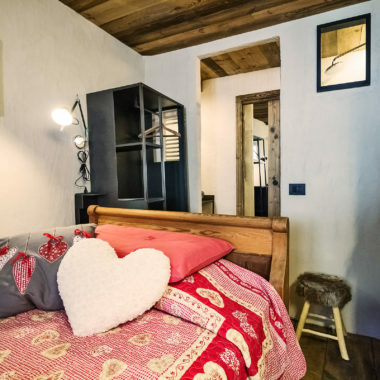 At the second floor there is one double and one Suite Room with an amazing view thanks to a big garret that let the light enter and see the surrounding mountains. 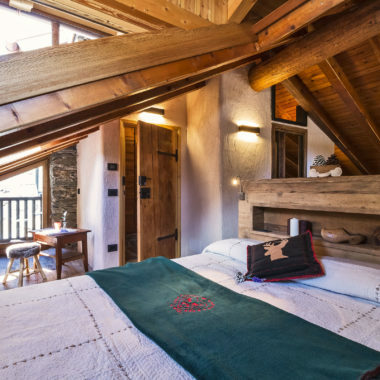 At the third floor there is the second Suite with terrace: 360degree stunning view of the alps. All the rooms have their own bathroom with stone showers, stone sink, modern iron furniture, and wood doors for a better experience. Sleeps 2, King Bed, roof place. Book your stay from our website! Flush up against France and linked by a dramatic cable-car ride to its cross-border cousin in Chamonix, Courmayeur is an activity-oriented Aosta village that has grafted upmarket ski facilities onto an ancient Roman bulwark. Its pièce de résistance is lofty Mont Blanc, Western Europe’s highest mountain – 4810m of solid rock and ice that rises like an impregnable wall above the narrow valleys of northwestern Italy, igniting awe in all who pass. In winter Courmayeur is a fashion parade of skiers bound for the high slopes above town that glisten with plenty of late-season snow. 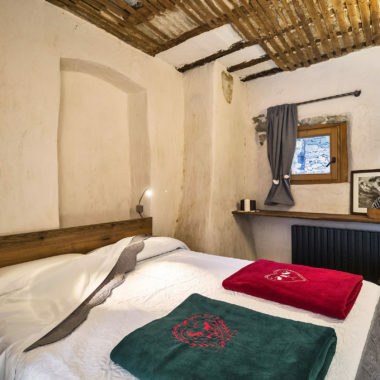 In summer it wears a distinctly different hat: the Società delle Guide Alpine di Courmayeur is bivouacked here and the town is an important staging post on three iconic long-distance hiking trails: the Tour du Mont Blanc (TMB), Alta Via 1 and Alta Via 2.